Living in Japan Part 4: How to Read Apartment Listings | What can I do with a B.A. in Japanese Studies? In my previous article, I explained many of the basics of what to keep in mind when you apartment hunt in Japan. Now you’ve got an idea of a location you might want to live (or at least have located some convenient areas) and you’ve opened up an apartment search site or two. You know what types of apartments exist, and have a basic idea of the costs you could be looking at. So how do you go about searching and interpreting apartment listings? This article will focus on the technical aspects of apartment listings and what to expect of apartments in general. Return to the previous article for a list of popular rental websites and an explanation of the basic search options (by area, rail line, station, etc.). Then, let’s start thinking about apartment advertisements by breaking down some common shorthand and vocabulary. Japan uses letter-based shorthand on their apartment listings and on floor plans. They will also combine these letters with numbers to count how many rooms are inside the apartment in addition to its features. You get the idea. Most listings will give variations up to 4K. In addition to these roman-letter shorthands, you’ll also find kanji commonly used in apartment floorplan images that denote the basic features included in the apartment. Room sizes are typically measured in tatami mat length (even if they have hardwood floors), with a single mat being approximately 90 x 180 cm. This means a small 1 bedroom, which is often 6 mats (jō 帖), is about 9.6 m². The area is about 103 ft². Japanese apartments typically DO NOT come furnished. Not even with basic things like a washer and dryer, as you find in America. Some companies that rent specifically to foreigners will have furnished options, but I suggest you look at reviews very carefully before deciding on the unknown. I’m working on a post about how to best (and cheaply) furnish your apartment as well, so look for that in the near future. But when you look at apartment listings, you’ll often find that the 洗 and 冷 symbols have an X marked over them (sometimes dotted), indicating that these are spaces in which you can place a washing machine or a refrigerator respectively. Older places will often have the space for the washing machine out on the balcony, which is not unusual in Japan. So let’s go ahead and look at an actual advertisement. 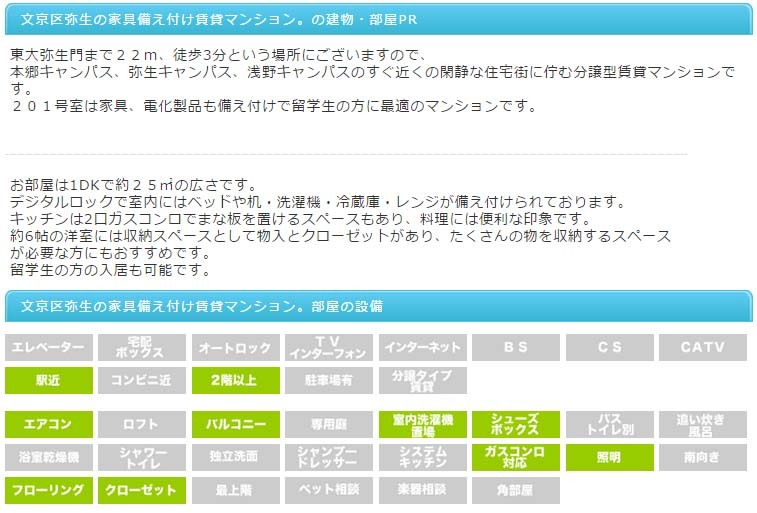 This is off of todai-sumai.com, which has a very straight-forward layout of information. The top information tells us that this is a 家具付き賃貸マンション, or a furnished rental apartment (mansion). Like I said, usually apartments are not furnished. This appears to be an exception. For details on upfront cost vocabulary, please return to our previous article . The rent (賃料) is 85,000 yen (roughly $850) per month, with no additional monthly management fee (管理費), a deposit (敷金) of 1 month’s rent, key money (礼金) of 1 month’s rent, no additional security deposit (保証金), and no additional key money (敷引). Note: I’ve been told 保証金 and 敷引are terms more commonly used in the Kansai and Tokai areas, but they seem to be equivalent in meaning to 敷金 and 礼金 respectively. The address (住所) is listed to the nearest city block(丁目), in this case Bunkyō ward, Yayoi 2 chōme 文京区弥生二丁目. The nearest station (最寄り) is listed, along with how far away it is on foot (徒歩), which is 6 minutes (分). 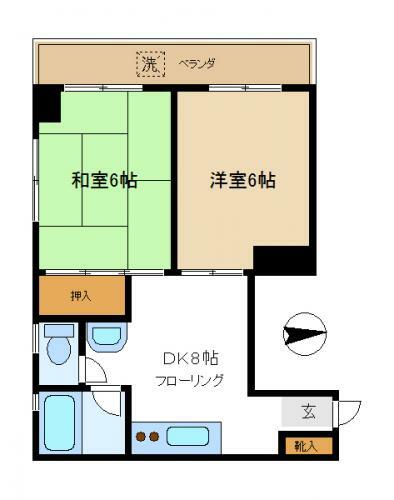 The layout of the apartment (間取り) is given as 1DK/洋6 K5, which tells us that this is a one bedroom apartment with a dining/kitchen area, the bedroom being a western (洋) style room that is 6 mats in size. The kitchen area is 5 mats. The area of the property (専有面積) is 25.06 m², and the date the building was constructed (築年月) is July 1989. It appears this advertisement actually has two apartments, one on the second and one on the third floor, as the floor (階数) is listed as 2/3. The direction the apartment faces (方位) is east (東). Remember that a south-facing apartment is the most desirable in an apartment, and north-facing the least. 1K or 1DK is a typical sized 1 bedroom for people in Japan. If you’re a foreigner who needs to spread out, however, you might find yourself a little claustrophobic in a 5 or 6 mat room. This might not be the case depending on the layout of the apartment, however. I ended up with a sweet deal on a 2K, with two western style rooms (6 mats and 4 mats respectively) and a 3.5 mat kitchen. However, it was FAR more spacious than other places of the same size that I looked at because the rooms were all conjoined with sliding doors that could open to create a seamless space straight through. (This can be useful for airing out the space in the summer and closing off spaces in the winter to retain heat.) Look at the layout of your apartments carefully to determine that the space is being used efficiently, taking note of where doors are placed and that closets to put away your things actually exist, especially in smaller apartments. Taking a look at the floorplan (pictured to the right), we can see the layout of our western-style bedroom (洋), which is approximately (約) 6 mats (6帖), and kitchen area (K), which is approximately 5 mats (and is connected to the front door/entryway (玄)). You’ll also notice that attached to the bedroom is the balcony (バルコニー), and two sets of closets (物入、CL). The main difference between these closets is that 物入 are meant for small furniture and bedding (like folded up futons) to keep a small 6 mat room from being cluttered, whereas a CL is a closet that is more western-style, probably with a bar for hanging your clothes. You can purchase tension bars for the 物入 to hang clothes or even store sets of drawers in them depending on the depth and the size. Note that in the kitchen there’s only a small amount of counter space, but you can’t see whether or not it has built in burners (which will often be shown on these floorplans, but not always). There’s also not necessarily an expectation that smaller apartments will have burners at all. You usually have to buy these yourself. Also note that the 冷 and 洗 spots for refrigerators and washing machines have X marks through them—this means there is space for them, but they are not included in the apartment (unlike most Western apartments). Since this advertisement is for two apartments, I suspect one of them has furniture and the other doesn’t, or they were too lazy to change the original image of the floor plan. The toilet and bathtub area in blue here are connected, which typically knocks down the price of apartments, as it’s less desirable than having separate toilet and washing areas. I won’t translate all of the details above, but note these little gray and green buttons, which show standard amenities of the apartment. Those in green are the ones this apartment has, such as being close to the station (駅近), being on the second floor or higher (2階以上), having an air conditioner (エアコン), or having fixtures for gas burners (ガスコンロ対応). You can see the larger vocabulary list at the end of this article for more of this vocabulary. Oftentimes when you’re looking at these rental websites they allow you to do advanced searches and narrow by many of these features, in case all electric vs. gas or having an air conditioner or not is a deal breaker for you. Here’s a quickie look at another advertisement for a slightly more spacious and expensive apartment, just for some more practice and to make a couple points. This apartment is 105,000 yen (about $1,050) per month with no additional management fee, 1 month’s deposit and one month’s key money. It’s a 2DK, meaning 2 bedrooms with dining/kitchen area, with the Western-style room measuring 6 mats, the Japanese-style room measuring 6 mats, and the dining/kitchen area measuring 8 mats. It’s on the 4th floor and is west-facing. The floorplan for this apartment is really nice, with a very long balcony (listed here as veranda ベランダ) with two sets of double doors that let in light to both the bedrooms. How the 6 mat Japanese style room on the left in green is illustrated shows you approximately how the entire mat-measuring system works in Japan. It’s worth noting that for all this space, though, only the Japanese-style room has a closet. If you don’t have a lot of stuff or you intend to use one of the rooms for some storage, this might be fine, but if not, you might end up having to buy a bureau or standing closet to make up for the lack of built-in storage. On the bottom right, however, you see there is a small closet for shoes (靴入) by the door. Also note that this advertisement shows there is space for two burners, shown with two brown dots. You should check the advertisement to see if they’re built in or you need to hook up your own. Some apartments may say they have a burner (electric or gas), but it also might only be just one. Some people don’t mind this, but as a foreigner who likes to cook, for me this would be difficult to get by with, and I usually ruled out apartments off the bat if they had limited or no space for burners. The bathroom, while tightly grouped together in one corner, is in fact separate bath and toilet, and the extra blue area next to the toilet is a washstand (typically a small sink/cabinet with a mirror for brushing your teeth. An apartment like this could definitely fit two people who don’t mind being cozy with each other and spending most of their time in their own rooms, but it might also be good for someone who doesn’t mind spending the extra money to have two rooms (maybe if you want a separate study or want to have the western room (instead of the kitchen) as your dining room and spread out your cooking space in the kitchen area. Because my landlady owns a shop on the first floor beneath my apartment, I’m able to deliver my rent in person and in cash. This will probably vary based on your situation. A Texan in Tokyo has a short paragraph about paying rent electronically, if that’s something you think you might have to do, but be sure to consult with your real estate agent or landlord about the best payment method for them. Have your bank book ready–you can often set up automatic withdrawal for housing companies (versus a small, private rental) or transfer the money yourself monthly. That’s it for my basic apartment hunting posts! I hope these were useful and can serve as a decent reference for someone in the future. If there’s anything I missed or you have further questions, drop us a line at shinpai.deshou@gmail.com or leave a comment below. If I can’t answer your question, I’ll try to find someone who can. This entry was posted in applications, blogs, culture, graduate school, housing, living abroad, main posts, undergraduate, useful links and tagged advertisements, apartment, apartment rental, housing, Japan, living in Japan, real estate agencies, rental. Bookmark the permalink. Paula, I do hope you turn all of this into a book ! But I miss the hand-written RE ads I had to learn to decipher in the ’70’s……where a unit with a bath included a drawing which looked just like an upside down jellyfish (it was supposed to be a bathtub with steam rising out of it). Ah, natsukashiiiiii wa! Sounds exciting! 😉 There’s something to be said for the personality of those ads, I’m sure! Pingback: Living in Japan Part 5: Furnishing Your Japanese Apartment | What can I do with a B.A. in Japanese Studies? Glad they’ve been helpful to you! 🙂 Thanks for reading!